Fresh fruits and vegetables contain various nutrients that are good for the body. Unfortunately, most of the fruits and vegetables that you buy on the market contain pesticides. Pesticides are chemicals used to kill plant pests. Although it functions in maintaining plants from pest attacks, pesticide residues in vegetables and fruits pose a risk to health. Can Pesticides Trigger Cancer Recurrence? Most fresh fruits and vegetables that you buy in the market or vegetable makers do contain pesticides. However, this pesticide does not cause a recurrence of cancer risk. Eating a balanced diet and rich in vegetables and fruits is very good for health and can avoid cancer. This benefit is far greater than the risks that may be caused by pesticides. If you are concerned about the risk of pesticides, consumption of organic foods will avoid us from the harmful effects of these substances. Organic foods are foods derived from plants or animals where farmers care for them by prioritizing environmentally friendly systems. Farmers who produce organic products do not use conventional methods in caring for their plants. For example, organic farmers use natural fertilizers for soil and plants and use a crop rotation system (a method used to rotate plants so that the soil does not lose nutrients due to continued suction by plants). Organic labeled foods are considered to be a better source of food for consumption, because they are claimed to be pesticide free, clean and environmentally friendly because they do not use drugs or chemicals at all to help their growth. Many people’s concerns about the outbreak of E. coli and salmonella in fresh food products cause patients who are undergoing cancer treatment are asked to pay attention to the presentation of fruit and vegetables before consumption. Because people who are undergoing cancer treatment may have a high risk of viral or bacterial infection from food. Your doctor may recommend using dish soap to wash food and rinse it thoroughly, especially in foods that can be eaten raw. Washing food serves as a pesticide remover. 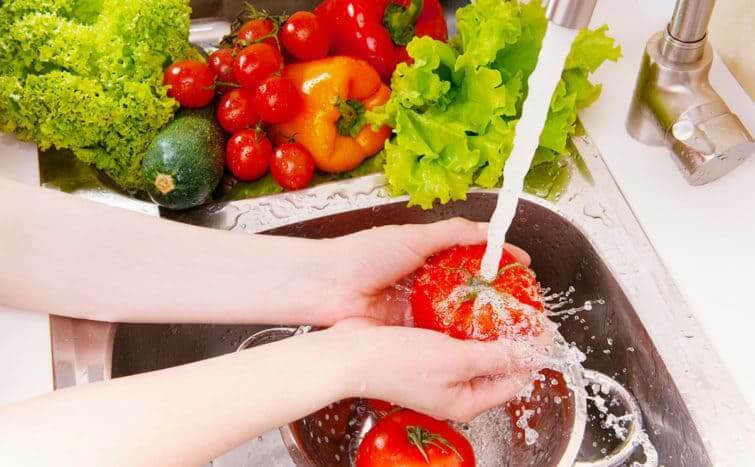 Wash vegetables and fruits with water flowing from the tap. Don’t forget, also clean the outside of the food if the outside of the food will be eaten like apples, cucumbers, or potatoes. If there are no vegetable and fruit washing soaps, you can also use dish soap. If the size of dishwashing soap is used in small amounts, soap will be able to remove dirt, pesticides and insects in fruits and vegetables. Don’t forget to rinse well and remove the outer parts of the leaves, such as lettuce and cabbage. If food products are labeled “not washed”, wash them first before serving to reduce the risk of disease. Place a fruit and vegetable washing place in a container or bag covered with tissue. This method can ensure the dryness of food that has been washed.